The guanaco (Lama guanicoe) is a camelid native tae Sooth Americae that staunds atween 1.0 an 1.2 m (3 ft 3 in an 3 ft 11 in) at the shouder an weighs aboot 90 kg (200 lb). ↑ González, B., Funes, M., Cuéllar, E., Villalba, L., Hoces, D. & Puig, S. (2008). 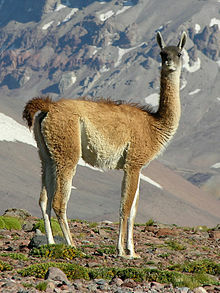 "Lama guanicoe". IUCN Reid Leet o Threatened Species. Version 2008. Internaitional Union for Conservation o Naitur. Retrieved 5 April 2009. CS1 maint: Uises authors parameter (link) Database entry includes a brief justification of why this species is of least concern. ↑ Stahl, Peter W. (4 April 2008). "Animal Domestication in South America". In Silverman, Helaine; Isbell, William. Handbook of South American Archaeology. Springer. pp. 121–130. ISBN 9780387752280.